No traffic signals, no curbs, no rules. Surprisingly, this doesn't lead to road rage and chaos, but to a dramatic drop in road accidents. 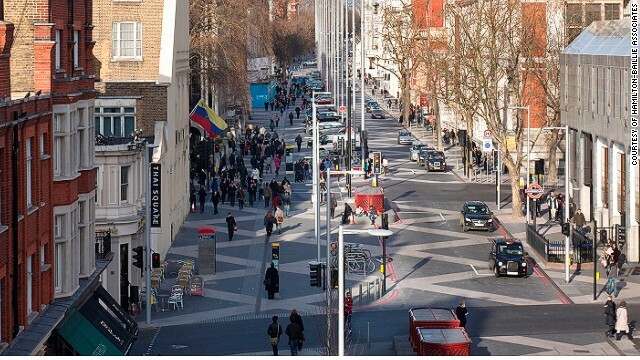 Exhibition Road in London is Britain's longest shared space scheme. 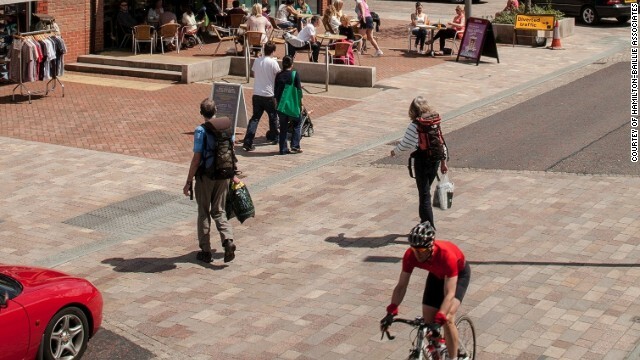 Shared spaces are changing urban environments, enabling motorists, pedestrians and cyclists to use roads as equals and without formal regulation. The concept of shared space is argued to be a default arrangement ever since streets began, pre-dating traditional road regulations. 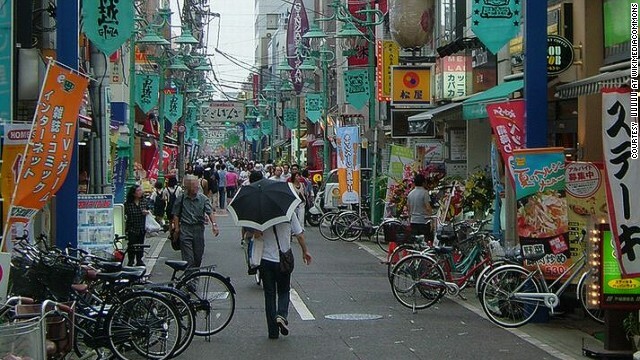 Many streets in Tokya are shared but without official policy to define user behaviour. Regeneration of the small town of Poynton in Cheshire, UK to a shared space has seen accident rates fall and the number of shoppers rise. Traffic signals are removed in anticipation of motorists and pedestrians moving in relation to one another. The Dutch town of Drachten was one of the first to change into a shared space by the pioneer Hans Monderman. 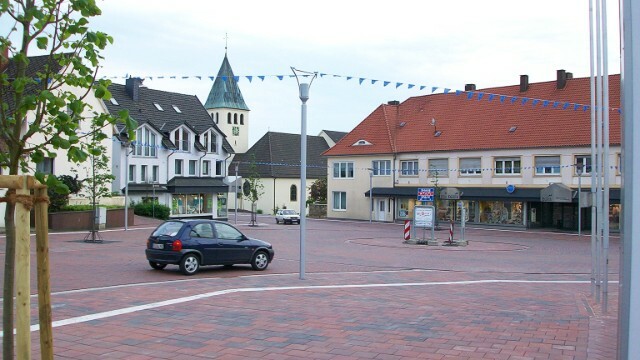 The German town of Bohmte was an early adopter of shared space in 2007. 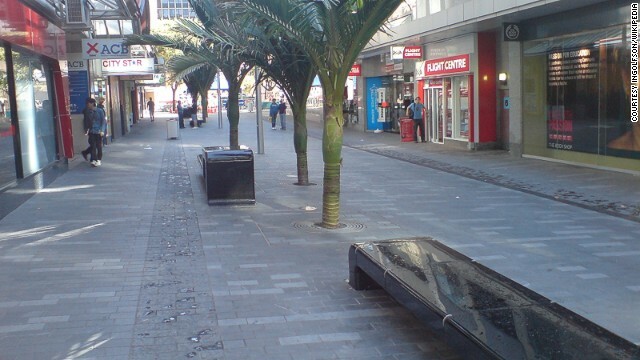 Darby Street is one of six new shared spaces opened in Auckland New Zealand since 2011. Is it safer to share? Shared spaces are changing urban street design by removing all formal rules and regulation. The objective is to make drivers and pedestrians more aware of their environment. Town centers become more comfortable and welcoming, with a boost to local economies. 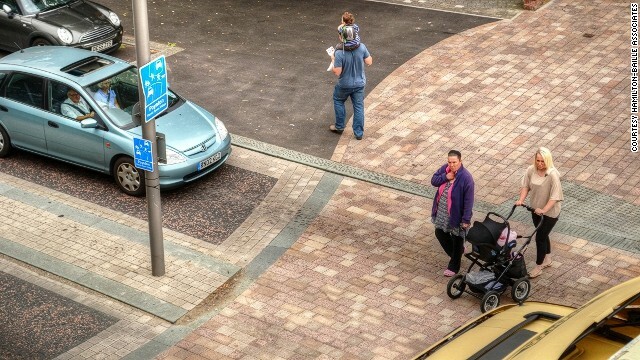 Consensus is not universal, though: the visually impaired are vulnerable in shared spaces. Editor's note: Future Cities offers an inside look at the rapid evolution of urban spaces, exploring new ideas, new technologies and new design concepts that might impact urban life throughout the world. (CNN) -- The future of urban roads may be one where motorists, pedestrians and cyclists act as one. Spaces where these usually segregated members of the population live -- or move -- by the same rules. Most importantly, these rules would be social, not formal, to befit the increasingly popular trend of 'shared space'. Road signs, traffic signals, roundabouts, crossing points and curbs are done away with and replaced by flat, smooth roads without markings, on which cars and people interact regularly. They may feel confused, but that's exactly the point. "Introducing ambiguity is central to shared space," explains Hamilton-Baillie. "If people feel unsafe that's good because they will then be cautious as they interact with traffic". 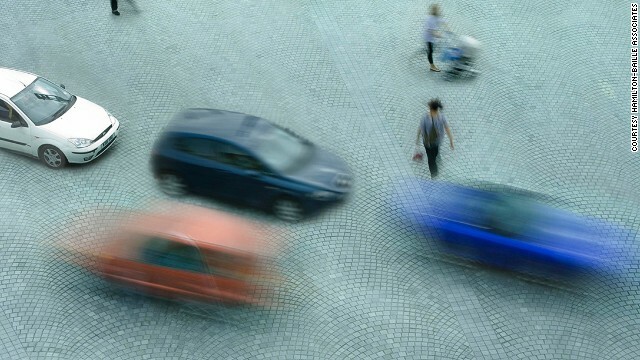 Hamilton-Baillie argues that drivers become more aware of their surroundings and respond to human interaction, just like people do in everyday life. "It civilizes and humanizes a city center," he argues. Take the example of Exhibition Road, in the museums district of South Kensington in London, U.K.. As a cultural mecca hosting three of the biggest cultural venues in the country as well as educational institutions such as Imperial College London, this road attracts over 11 million visitors each year. Walking along it once involved by-passing hundreds of school children and families, countless students and tourists queuing at entrances or dawdling lost and confused, all upon a narrow pavement that couldn't contain them all. In December 2011, this road became a shared space and is now stripped of everything you would expect to find here. It instead houses benches and bus stops in the middle of the street and greater space to flow through for the hundreds of visitors it sees each day. "We have changed this unwelcoming road into a world class streetscape -- a stunning public space that can be enjoyed by all," says the Royal Borough of Kensington and Chelsea proudly on their website. This local authority made the decision to transition the widely-used space. "The quality of the space is the central focus," explains Hamilton-Baillie. But Exhibition Road in London is not your usual street. The majority of urban landscapes do not attract millions of people. Shared streets are primarily intended for more traditional and even mundane locations where people interact every day, such as a local town center. 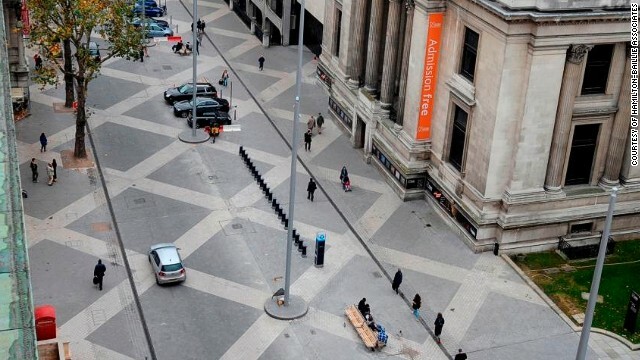 It defines a public space where movement is subject to social protocol and informal regulation, not traffic rules. The town of Drachten in the Netherlands was one of the first to experiment the concept in 2002 by removing nearly all traffic signals with the aim of reducing accidents and improving both the towns quality and popularity. Despite increases in traffic volumes, accident numbers fell from 8.3 per year between 1994 and 2002 to an average of just one per year in 2005. Spaces were soon introduced in the towns of Makkinga in the Netherlands and Bohmte in Germany which removed all traffic lights and signals, and then in 2011 more further afield on six streets in Auckland, New Zealand. Eighty percent of shared space users in the Fort street area of Auckland reported feeling safer and 72 percent of drivers felt their journeys were either the same or shorter, so users appear to be happy. "The real aspect of shared space is economics," explains Hamilton-Baillie. "Town and city centers are changing and becoming redundant, you don't need them anymore and so we need people to go because they wish to and feel welcomed." This was the case for the small town of Poynton in the county of Cheshire in Northern England. The town had seen the quality of its town center plummet with increased traffic flow and congestion, closure of retail outlets and a decline in shoppers. Its conversion into a shared space made the town more welcoming, increased footfall in eighty percent of retailers and elevated the 'dwell time' of people as they shopped. The goal of capturing their spending power was met. Traffic speeds also fell to an average of 16-17 mph, according to Hamilton-Baillie, leading to free-flowing traffic and a reduction in accidents and fatalities from 1.1 per year to zero, since its introduction. "Poynton is not unique and it's like many other areas across the UK so it's an example of what's possible," says Hamilton-Baillie. The concept is being adopted across the Western World with the Congress for New Urbanism in the U.S., whose aim is to reverse the decline in urban quality and economics, recently including shared spaces at the center of debates on future design. Schemes are being considered or already exist in many states including Florida, Massachusetts and Oregon. Hamilton-Baillie argues it's not a new concept however, and is a default arrangement ever since streets began. "If you go to the center of Delhi, or Dakar, you'll see plenty of shared spaces that are not subject to regulatory framework. But are these default arrangements really suited to all towns and members of the population? Professor Rob Imrie from Goldsmiths University in the U.K., thinks otherwise: "To me the principle is wrong," he says. "People and cars do not mix, a car is an object and I don't want one driving two feet past me." Imrie argues that an aesthetic environment can still exist with separate space for pedestrians and believes shared spaces are more suited to environments with less traffic passing through. "In the Netherlands they have been successful because they are in areas with less traffic," says Imrie. But his main concerns lie with disability groups, such as the visually impaired. "The visually impaired have the majority of the problems as there's no easy means of navigation," says Imrie. The spaces require new environmental learning for the visually impaired which Imrie believes causes a psychological issue. "People work on intuition and belief systems and if they're uncomfortable the visually impaired won't go there anymore." But he doesn't want the concept to be removed, just rethought: "We should maintain some order whilst also creating this calming effect for users." The use of tactile surfaces at edges and marginally raised curbs is one way of overcoming the issue whilst maintaining the desired environment. The local authority at Exhibition Road have also introduced tactile maps at the start of the street to help blind people plan and navigate. Hamilton-Baillie feels the visually impaired can remain as safe as in any usual environment. "Shared spaces encompass the way we would act in real life," he concludes. "It's difficult to regulate your behavior for someone partially sighted, or even a child, but our social responses are very strong and people accommodate it." The concept is growing and it's likely we'll be seeing more of these streets uniting us with our fellow navigators. The key, as with any innovation, could be to acclimatize. "Shared space can work on any urban scale, the key is to gain confidence with experience." A $1.5 million home made from junk? In the Swedish city of Malmo, an old shipyard has been converted from industrial wasteland to spotless eco-district. 80,000 cups of tea a day from a bridge? Over 4,400 solar panels compose the roof of Blackfriars bridge in the City of London, making it the largest solar-powered bridge in the world. Could sewage be recycled to provide water that's cleaner than what comes out of your tap? 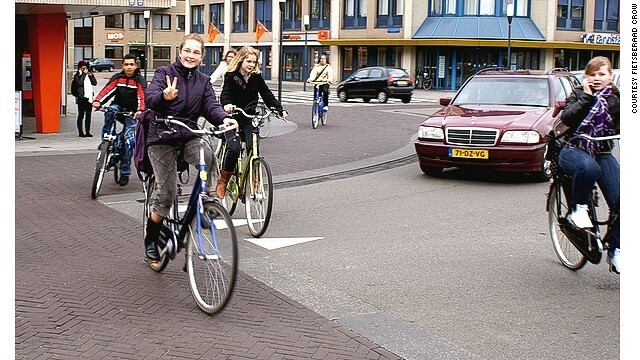 The future of urban roads may be one where motorists, pedestrians and cyclists act as one. Is the bus the future of mobility? Autonomous vehicles, levitating trains and supersonic tubes? Not really. It seems the real secret to a faster commute has been with us all along -- the bus. Transparent solar cells and a wonder material called perovskite are among a few innovative technologies that will put solar energy in a new light. CNN's Richard Quest hits the streets of Hong Kong see how night often becomes day. CNN's Future Cities travels to Tokyo, home to 13 million people and an endless amounts of trash. Hong Kong continues to grapple with incredible urban density and a real lack of open space. CNN's Jim Boulden travels to Dublin to look at how the Irish capital is using its airport to attract "green" businesses. The UN predicts that, by 2025, Dhaka will be larger than Beijing and Mexico City, with a population pushing 25 million. CNN's Richard Quest takes a tour around the construction site of Doha's new airport. Sitting between snow-covered peaks and the Pacific Ocean, Vancouver is the perfect location for the outdoor enthusiast. In Tokyo companies allow owners to bring their pets in to shops to workout and get exercise.